Microsoft appear to be launching their new mapping application on Monday, but it looks like Virtual Earth is accessible, although performance is likely to be patchy until the official launch. There was initially speculation from Niall that it would be an RSS Search that was going to be launched – maybe that is coming as well? I know a there’s a sterotypical American who knows nothing outside of their own borders, but missing off London is a lttle worrying. 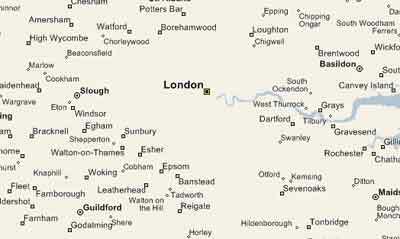 Once zoomed in enought to see London, it still seems to live in a vacuum. Does Microsoft know something I should know? Update: I see it’s hidden again until the official beta launch.